I must apologize to all my "ranties" for not posting a rant on Friday. Had to take care of stuff at home. But anyway The Rant is back,and I have plenty to talk about after this weekend's festivities! 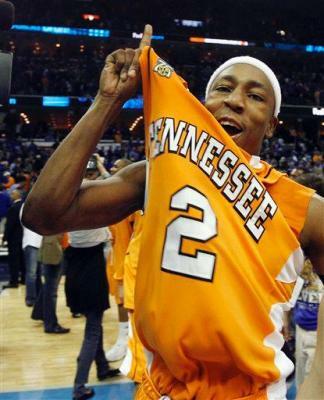 Congrats to the new #1 team in the country; the Tennessee Volunteers. Bruce Pearl had his boys ready to play, and they met the challenge of playing the #1 team in the country on it's home floor. Sports fans argue all the time about whether or not its good for a team to lose prior to tournaments or playoffs.....I tend to think it depends on the scenario. It can be good just to take off the additional pressure/distractions the pursuit of an undefeated season can bring. (Just ask the Patriots)! In the case of Memphis, I think it was good to get the loss out the way now. I don't think it was realistic for them to go undefeated through a regular season and the NCAA tourney. Now with the loss out the way, this team will be focused and primed for March Madness. Forget the B.S. everybody is talking about the Suns needing to adjust to shaq or vise versa. This team is not very good without Marion and its not going to get any better! It was a terrible trade......period! Detroit absolutely rolled the Suns Sunday afternoon on their home floor by 30! The Suns can't run half court sets...that's not their style. Think of it like this......its like the Bears switching from a "pro set"style offense to a west coast "run and shoot" style offense during week 10 of the NFL season! It makes no sense for several reasons. They don't have the personnel to run that style offense, and you don't go change your offense in the middle of the season! The same goes for the NBA! The other arguments I have heard in regards of this trade is getting Shaq allows Amare to play his true position. Yes, his scoring has increased but now he plays less defense than he did before (and that wasn't much)! On top of that, all those wide open jumpers Raja and Grant Hill got with Marion in the line up just are not their anymore. Grant didn't score on Sunday and Raja had 7 points! Suns fans ....that window you heard closing prior to the trade just slammed shut after you traded for Shaq. If I'm wrong I will be the first to admit it....but I don't think I have anything to worry about! Whose on Fire you ask? Houston Rockets- winners of 12 straight! Tiger Woods- 5 straight tournament wins! L.A. Lakers - 8 straight wins! This page contains a single article from February 24, 2008 4:43 PM. The next days article was Home of Greg Gamble's Daily NBA ATS Luv .